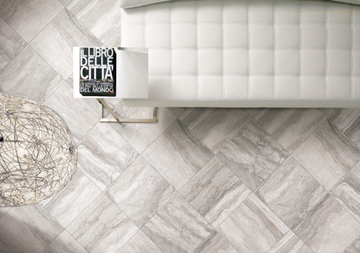 Introducing Tiber Stone, Italian porcelain that replicates the beauty of Tuscan travertine stones. A rich, vein-cut look that comes in refined tones of ivory, gold, grey or black. This glazed porcelain tile series offers traditional sizes along with sleek, contemporary rectangle formats - perfect to enhance a floor pattern or a backsplash installation. Embellish any design with the unique basketweave mosaic.